On Thursday November 5th, 2015, RV’ers came together and fought an RV motor home fire in hopes to rescue a trapped dog. This 16 minutes of realtime footage was caught by our dash camera (BlackVue DR650GW-2CH). I digitally edited the footage without touching the timeline and added narration as the events unfolded. It is totally amazing to say the least how things can change and “life happens”. 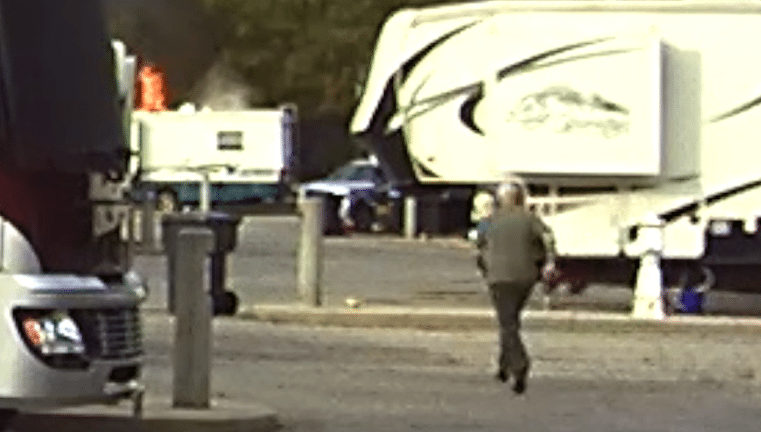 One minute you are chatting with a friend you have not seen in some time, and the next you are side by side fighting an RV fire along with two other RV’ers. The RV owner was not home at the time and we knew a dog was inside. What totally amazed us was, as you will see, all of this time passed and yet, somehow, someway, we saved that dog even though it did not seem likely. We keep asking ourselves, how? How did he make it? With the heat, the toxic smoke, and the large amount of time, one would surely have thought the worst. And we did. But alas it goes to show you…DO NOT GIVE UP. Have Hope! This fire is believed to have been caused by a Norcold fridge that had a recall per the fire inspector. To us, in our humble opinion, that surely seemed to be the case. The RV was a total loss and the owner was a full timer. This would be Brenda’s and my second RV fire we fought within the last 4 years. Three chemical extinguishers and three foam extinguishers along with two garden hoses were used to knock down the fire and keep it at bay until the fire department arrived. Good Samaritans RV’ers: David & Brenda Bott, Jim Andrews, John (man in red) and Unknown “Man on Roof”. Unseen is John’s wife Jone who brought over water at the end for the dog “Zoey” and to poor over my head to get the glass off of it as well as help flush my eyes. We love the RV community that comes with this lifestyle this is an perfect example as to why RV’ers are great people that come together to help someone, or something, in need. Thanks. And yes, so are we. It was so amazing to see him walk out of the coach. Great video! Thanks for sticking with your fire fighting efforts!! Glad no one was hurt, especially not any of the RVers trying to help. I hate to hear about Norcold Refrigerator fires. We have one too, have had all the recall work done but you never know. Wow, David and Brenda. Heroes!! Thanks so much for posting this. I’m so glad the dog survived. We are brand new RV owners and our Tiffin Allegro Bus has a Norcold fridge in it, but we are not taking possession of our RV until it is replaced with an all electric fridge. Then we will be full-timers. Hope we meet you both someday. I know this is “late to the party” – it’s an old discussion. But I stumbled onto it now, and just want to agree that “all electric” was one criterion for us when we bought our current motorhome. It’s a sensitive topic – most RV refrigerators in use today are still the old-fashioned adsorbtion type (propane), and when it comes up, all the owners of these RVs vehemently defend them as a non-issue. But a quick Google search on “RV propane fires” returns lots of hits, and the issue is real, regardless of its nay-sayers. So called “all-electric” RVs remove propane from the equation, and that’s a relief, far as I’m concerned. I wouldn’t go back to propane, given that there’s no need to. Out name of the dog, THANKS. So grateful you guys were there to make a difference. We’ve all been well versed on how quickly a fire can destroy a motorhome literally burning it to the ground. A fire lasting 20 minutes SHOULD have had that resultt; however your actions saved that sweet fur baby’s life! This goes to show how effective those fire extinguishers can be. Very proud of you flame fighters! Hey you guys are patriotic troopers to the max. Proud of each of you and the dog as well. After 27 years in law enforcement I can tell you that you’re what America was made from. God Bless All. David and Brenda, way to go!!! In life, very few people are presented with situations, like this one, that demonstrates what they are made of. Instead of “freaking out”, as I have seen many people do in similar situations, your quick reaction, team work and mental focus really saved the day. My best regards to all the RV “first responders” who made this outcome a happy one. Also, I find it very interesting that your most recent post was about smoke detectors! I look forward to your next post about which fire extinguisher was most effective in combating the fire. great work. we all need to be aware, have a plan, check fire extinguishers frequently, keep our eyes open and don’t be afraid to jump in and try! David, thanks so much for sharing this. Lot’s of lessons learned. Kudos to all of you! I hope the owner has the means to get back on his feet and recover from his losses. At least he has his best friend by his side! Wow great job Dave and Brenda and all that helped with a great outcome saving the dog.RVer`s are a special group of people for sure. Awesome job responding to the fire. An “above and beyond” response. You’re really great people to do so. I’m sitting here with my dog in my lap, who travels with me all the time. It means a lot to have folks like you out there to help when it’s needed. Thanks! Way to go David and Brenda, and all those who help out. Outstanding video!! Jim’s face upon seeing the fire is priceless! Fantastic use of fire extinguishers. The RV industry should use this video to educate others! You guys were AWESOME! What a wonderful story! Thank you for your heroism and for sharing. Great fire fighting techniques and efforts. Awesome job!!!! I can’t believe we napped thru the whole thing!!! At the angle we are at we couldn’t see it and with fans TV’s and air conditioning going we ere in la la land. So thankful for Zoey you were where you could rush to her aid!!!! Sonny would have been the one on the roof and I would have been the one panicking and screaming get Zoey!!!!! So glad the pup made it and that no lives were lost. Congratulations!!!!! Your efforts DID save a LIFE!!!!!! Great Job and great narration. Nice running Brenda!!. We have 2 fire extinguishers. One mounted in the bedroom. But we don’t have any foam. Need to look into that. You are something else. We are so thankful to have found your web site and to now be a part of your journey in life. Yes, what great team work. Yes, how amazing the dog survived. What a great ending. ? How ironic David. We were just talking about the smoke detectors before you all left Red Bay. Thank you all for keeping the fire in check til help arrived. There is no doubt that saved that dogs life. Nice job. Good goin Dave & Brenda. Do you know if the Norcold recalls had been complied with on this one.? What model was it? Unsure and unsure. Sorry but it really was not on my mind. You are all amazing people! Well done!! David and Brenda, you are true hero’s. We love your posts and as always thank you for all of your tips and insight! Beautiful and touching story.. thank you for sharing! We can only hope that should any of us encounter such a situation, we have the quick thinking and call to action you guys did. Good job guys. A fire in my RV scares me more than anything as we have 2 cats, can you imagine trying to get hold of them and get them out of a closet, cupboard or from their favorite place, under the couch? The fire department would think it was all clear because there’s no way the cats would come out. I think I need to have something in one of the windows stating we have 2 cats who like to hide under the couch just in case anything happens while we are away. This has been a real eye opener and I appreciate you posting and narrating it. Certainly going to get more fire extinguishers to go with the 2 we have. Well done for your quick thinking in the face of adversity, without you guys I doubt the dog would have made it. Heroes indeed. That was awesome! Thank you fellow RVers for saving that puppy’s life! Great job, as others said without you that RV would surely have burned completely before the fire department arrived. When we first started traveling we heard about an RV left in a park in Texas that was evacuated due to a wildfire. The owners were out traveling and no one had a way to reach them. We installed a cheap master lock combination key safe in the basement nearest the door with our RV keys in it. We also put a sign in the window letting people know our pets were inside and listing our cell phone numbers. If someone called we could give them the code to the safe and they’d be able to open the RV. It’s cheap insurance for your pets lives! Without a doubt your best post ever…We have two dogs that travel with us and they are our family (We have no children). Incredible video. Thank you for sharing this heroic story! Great Job all of you. Great heroic folk in the community. Thank Good everyone was OK. Way to go! You all are true heros! Such a coincidence after last weeks smoke detector video you put out. Saw this video last night. First thing I did this morning was go out and got two additional new fire extinguishers to sit under the kitchen sink and the other next to the washer & dryer. Am getting another one for the car to go with our earthquake / disaster grab bag kit which is something most people forget about. Remember we aren’t always in the rig when something could happen. You need a disaster kit in the car as well that you can grab from the trunk in an emergency. Spare clothes, water, food, cash, digital backup of important files, flash light, battery powered radio, and anything else you might need for a 48 hour disaster period. Nice job on the quick response…you guys did not hesitate for a moment. I get that you have a dash cam that you keep ‘live’ all of the time, but do you really keep the video recording inside the coach all of the time, too? Video happens on motion detection inside and out. So yes, the video is also recording inside. It is pointed towards the door to capture anyone coming in or out. Then we have the Piper security camera also but that one only records when it is armed. We do not see an issue with it recording inside all the time, after all, unless someones steals the camera, no worries. But even at that, the SSD card only keeps about 2 days worth of video. What brand is your dash cam that you have . I’m a volunteer fireman and you all did a excellent job. Awesome Job! You guys rock!! 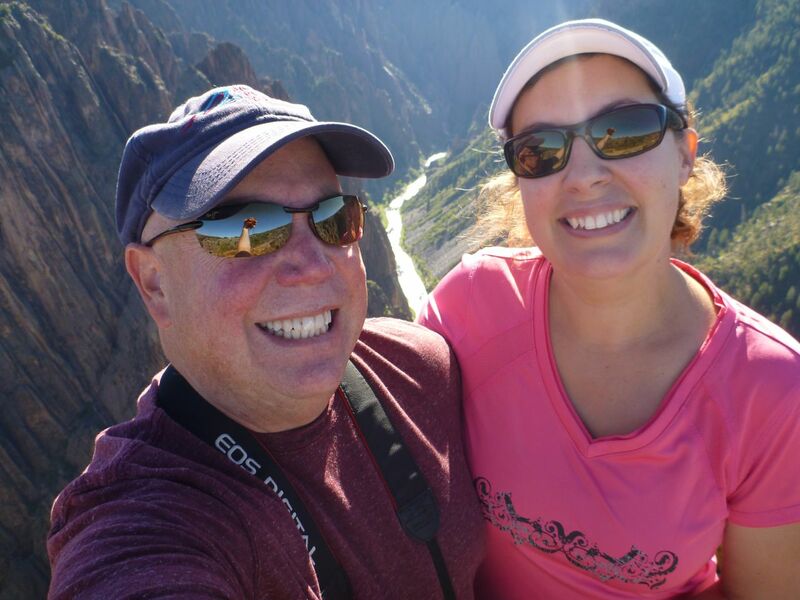 David & Brenda – You guys ROCK. Job well done! We have 3 very tiny Yorkshire Terriers that travel with us. We just came back from Disney World and in the coach next to us owners had posted on their windshield in huge letters their name and cell phone number along with several yellow pet triangles letting people know they had 3 dogs inside. I had never seen that before but now think it is an excellent idea. Wow!!! So glad things turned out well! You guys did a fantastic job! I hope never to be in that position, but if I were, I hope you guys are all there!!! Wow! I don’t think the dog would have been able to survive if you guys had not controlled the fire. The quick response by you, Brenda, & Jim, and then some other RV’ers, saved that dogs life! All of you should be proud! That is what is so great about the RV community. We all help each other. What camera was in use at the time of this incedent? Hi…Please look at the 1st paragraph. It was listed there with a link. Thanks. Sorry, I had watched the video but did not read the article, my bad. Just ran across this today. Our motorhome burned from the refrigerator 3 years ago in a park. Yes, Rv’rs are the best. Since we had been in the park on and off for several years, we were known as were the dogs. I was in and smelled and found the smoke and got myself and our dogs out. But when neighbors noticed they first asked where the dogs and I were, called 911 and came to help. The RV community is the best. What an awesome job you did! Thinking about the owner’s bad luck and the sweet dog just breaks my heart. You guys did an excellent job on the fire. Can’t think of anything else you could have done with the restricted equipment at hand. Being a firefighter myself, I can tell you how lucky you were to not getting hurt. Blessings to you and who helped you. As a retired Fire Chief with 40 years of fire service I would like to offer some sound suggestions to your followers on the subject of portable fire extinguishers. I think its really commendable the group was hastily assembled, non firefighters who didn’t think anything of trying to help, I was proud to view the video. none of what I am posting is critical in any way just to be clear. The 2.5 lb. small extinguishers provided at the front doors of most RV’s are really a token unit made for compliance issues and will work quite well for an in house kitchen or waste basket fire. However we in the fire service have always been amazed there is no requirement for at least minimum 10 lb ABC and preferably at least one 20 lb ABC extinguishers. The knockdown capability of the larger units is much more comprehensive and considering the cost of 45 foot deluxe coaches like your Tiffin spending a couple hundred dollars on better equipment should be really considered. The fire you were fighting in our world would be considered a structural event, to provide suppression comparable to the cost the larger ones should be explored to protect a $400,000 unit. Public Education is one of the tenets of the fire service, I am not advocating lay citizens should do this effort on a regular basis but as an industry professional have offered to contribute. This was a perfect example of a fire can happen to anyone, anywhere day or night. As in real life the RVers probably don’t consider in the day to day realm a lot about fire protection resources until it comes time to dial 911. My wife and I are travelling down to Red Bay this month to oversee a purchase and build a 45OP for ourselves and I am thrilled you went to the length to chronicle your experience. We will do the same thing when the time comes minus setting up a blog. With the vast amount of storage provided on Tiffin coaches locating and securing the larger extinguishers shouldn’t take away usable space. There is no doubt in my mind you all saved the dogs life, you also mentioned ventilating a couple of times and that is another critical issue of when and how much to ventilate especially without a primary water supply, in this case the less was better until qualified help arrived. Now that I have found your blog/website look toward further adventures and Marie and I look forward to actually meeting you and Brenda once built and rolling. Thanks from Central Canada. we appreciate your input! We only have the one that came with our 40′ Phaeton. We need to upgrade and buy some foam extinguishers. I too am just seeing this video and will add my “Wow” to all of those who helped. This really hits home with me, as I recently bought a 2010 Winnebago Journey. At the time I had no idea about the Norcold issue, but thankfully, at the Quartzsite rally in January, I learned of the problem. My refrigerator was on the recall list, so thankfully that is now remedied. I also got an extinguisher that is triggered by heat installed within the refrigerator compartment, and several other foam extinguishers. I have learned so much from this and plan to create a disaster kit for my car, and to post my cell phone number where it can be seen. Pretty sobering. I’m so thankful that you jumped into action and that the dog was saved. I’m going out to my RV now to make sure that my emergency exit window in the bedroom actually opens! Thank you so much. What a great post and educational video! We just discovered your blog and DH has been watching and learning lots. We love Red Bay and go every year now. Mainly to shop in the store. We also spend some of the winter in LA (lower Alabama). We were stationed in Mobile for three years and fell in love with the people and pace of life. Anyway, we have to assume this occurred at the Tiffin Service Center? We couldn’t tell. We were looking at your Alabama posts and are always looking for other RV parks. Thanks again! We are going to upgrade our extinguisher and get some foam ones as well. That was at the Hoover, AL campground. Heroes, one and all. You are dealing with a lot of fuel, oil, LP gas contained in tons of ragged metal when it blows. Even blowing tires will do a number. Heroes run towards trouble.! Great job by all. Proud to call you fellow Americans!!!!! WOW WOW WOW!! This is a great job of capturing the and narrating it as well. So glad you, your wife and other RVers were able to help save the dog and as much as possible the RV, although I assume it was totalled. Wow..I’m not sure how I found this, but the whole issue of fires and RV’s was brought up on the IRV2.com forum and I’ve posted this link so other folks can see your amazing efforts. I have to ask…at any time were you concerned with the fire getting to the propane and there being a BIG explosion? I know my wife would be screaming at me to GET AWAY GET AWAY! the whole time and I’m a bit surprised you wife wasn’t doing the same thing. Again, great job, I sure many of us learned something useful from watching this, and so glad no one was seriously hurt.